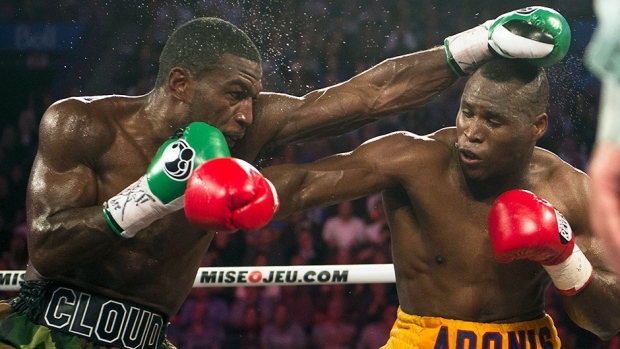 Adonis Stevenson hopes he's shown his detractors that he is more than just a big puncher. The Blainville, Que., fighter certainly displayed some of the boxing skills he has picked up in two years of training at Detroit's famous Kronk Gym as he stopped Tavoris Cloud in seven rounds to retain his WBC light heavyweight title on Saturday night at the Bell Centre. But the power punches the left-hander landed on the former IBF champion also played a part in stopping Cloud before the limit for the first time in his career. Cloud (24-2), the former IBF champion, had been cut on the left eye in the opening round and did not answer the bell for the eighth after sustaining a cut over his right eye. "I'm proud, because I worked hard and I showed I can box," said Stevenson (22-1), Canada's only boxer with a world title. "I did everything according to my game plan. "My corner said to go to the body. I knew the longer it went on it would be in my favour because I was wearing him down." Stevenson's career was at an impasse two years ago when he decided to ask legendary trainer Emanuel Steward to take him in. Steward died last year of an intestinal ailment, but his nephew Jovan (Sugar) Hill has kept Stevenson on the same program. "We worked a lot on footwork, watching Ray Robinson who had beautiful footwork," said Hill. "That's something Adonis showed tonight." Cloud was detained in dope testing after the match and opted not to speak to the media. His promoter Don King tipped his hat to Stevenson. "Superman was here and we didn't have any Kryptonite," said King referring to Stevenson's ring nickname. "Tavoris did a great job of being able to take it, but not of being able to give it. "(Stevenson) used a bit of Ali and a bit of Tyson. I was truly entertained." The three ringside judges all had Stevenson winning all seven rounds before the stoppage. Cloud, a righty, hardly threw his right hand at all, which may have come from being cautious about leaving himself open against a power-punching lefty. That drew taunting from Stevenson, who twice stood before his opponent with his arms stretched out, daring him to throw a punch. Stevenson won the title with a spectacular first-round knockout of Chad Dawson in June. The HBO specialty channel arranged the bout with Cloud, hoping to see how he would do against a skilled opponent known for being able to take a punch. 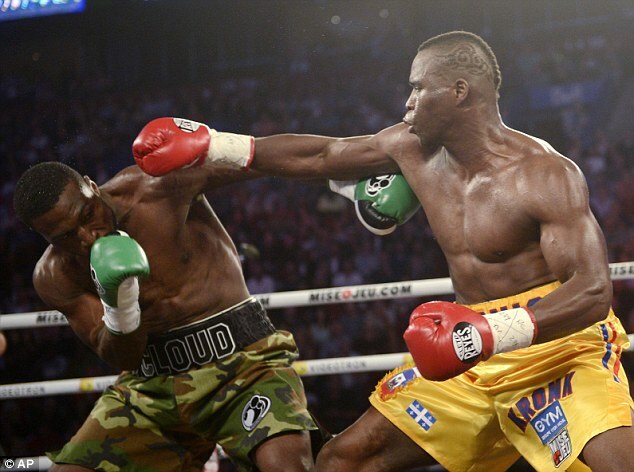 But Stevenson landed a stiff left in the first round, opening a cut on Cloud's eyelid. He turned up the pressure starting into the fourth round and it appeared to be only a matter of time before the Tallahassee, Fla. native went down. His corner signalled to referee Michael Griffin that the bout was over after the seventh. Watching from ringside was Tony Bellew, the mandatory challenger for the WBC belt. The Englishman said he has a signed deal to fight Stevenson Nov. 30 in Quebec City, although promoter Yvon Michel said this week no firm date has been set. Bellew feels he can succeed where Cloud failed. "I'm not five-foot-10 like Cloud and I'm not scared or intimidated by Adonis Stevenson," said six-foot-three Bellew. "I'll come with a game plan and execute it. "I'll come as an underdog and leave with his belt. I'll fight on my strengths, not his. My 31st birthday is Nov. 30 and I plan to become world champion on that date too." It was Cloud's second loss in a row after ceding his title to veteran Bernard Hopkins in March. In the co-feature, former light heavyweight champion Jean Pascal stopped George (Honey Boy) Blades with three knockdowns in the fifth round. Pascal (28-2-1), who had not fought since December, was in a tune-up bout for his scheduled showdown in January with fellow Montreal fighter Lucian Bute, who also watched from ringside. Blades (23-5-2) never threatened Pascal. The 38-year-old has a bizarre record built up against C-level opponents. He has faced fighters with winning records only six times, and is 1-5 against them. Pascal was going for the knockout from the opening bell. He finally caught Blades with an upper cut and dropped him with a combination in the fifth. Twice Blades got up, only to be pummelled to the canvas again before referee Marlon B. Wright stopped the bout. "I was a little tight at the beginning," said Pascal. "I tried to beat him with power and it wasn't working. "We said 'use speed instead of power' and it was speed and put him down." The Bell Centre crowd of 9,122 was evenly split in chanting the names of Pascal and Bute as the fighters entered the ring. Bute stood and applauded Pascal in a show of sportsmanship. He saw Pascal score his first KO since 2009. "This does me an enormous amount of good," said Pascal. "I'm a guy with power but it had been a long time since I knocked anyone out. "Now I'll go into camp with more confidence." 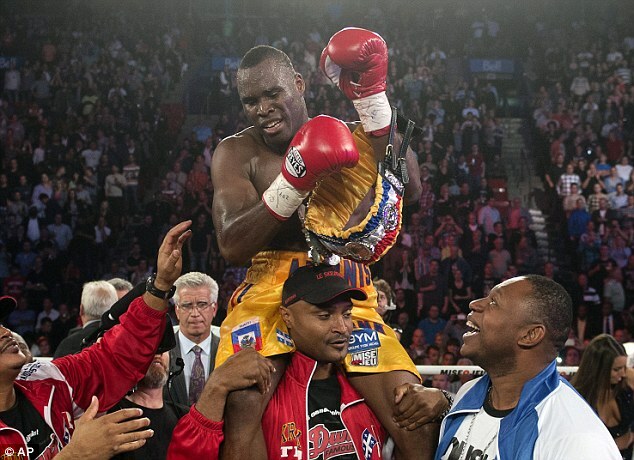 A matchup of Colombian light heavyweights saw Eleider Alvarez (13-0) of Montreal dominate veteran Edison Miranda for a 10-round unanimous decision in probably his toughest pro fight to date. Alvarez landed consistently with the right from the fourth round on, and scored a knockdown in the eighth with a right hook, but Miranda made it a hard-fought physical bout. It confused the ringside judges, producing scores of 99-90, 97-92 and 95-94. Another light heavyweight bout saw Artur Beterbiev, a Russian fighting out of Montreal, improve to 2-0 with a second round stoppage of veteran Rayco Saunders (23-23-2). Montreal welterweight Antonin Decarie (28-2) was back in the ring for the first time since his loss in Argentina in April to Luis Carlos Abregu and found himself in tough against Frenchman Salim Larbi (17-4-2). Decarie was cut over the left eye in the fourth round but did enough to earn a six-round unanimous decision. Welterweight Kevin Bizier (21-0) of St. Emile, Que., had little trouble scoring a six-round unanimous decision over 37-year-old former European champion Giuseppe Lauri of Italy, who went down to a sixth straight defeat. Tony Bellew will challenge Adonis Stevenson for the WBC light-heavyweight world title after the Canadian made a successful first defence of his belt against Tavoris Cloud on Saturday night. Stevenson - nicknamed Superman - was imperious as he dismantled the former world champion before the fight was stopped at the end of the seventh round. And he will meet his mandatory challenger Bellew back at the Bell Centre in Montreal on November 30 - the Liverpudlian's 31st birthday. Bellew, who was ringside on Saturday, earned his shot at the champion in May when he beat Isaac Chilemba at the second time of asking in a final eliminator at the O2 Arena in London. His clash with Stevenson will come two years after his first world title challenge against Welshman Nathan Cleverly, a fight he lost by majority decision. Since then Bellew has recorded victories over Danny McIntosh, Edison Miranda and Roberto Bolonti before his double-header with Chilemba. And he will now face a man who has made a stunning start to life in the division. Having campaigned at super middleweight without landing a world title shot, he moved up to rip the WBC strap from Chad Dawson with a blistering 76-second knockout in June. Cloud had not fought for more than six months since losing his IBF belt to Bernard Hopkins in his first defeat as a professional. And he was on the back foot in the early stages against Stevenson as the home favourite looked to land his devastating left hand. The American started the third round as the aggressor but remained susceptible to Stevenson's power on the counter from his southpaw stance. And by the fourth session the champion had his hands by his side, taunting Cloud as he peppered the visitor with both hands. Stevenson continued to assert his dominance as the fight reached the midway point and with Cloud cut above both eyes by the end of the seventh stanza, his corner pulled their man out. 'I got my mandatory next and I'll let my promoter fix that,' Stevenson said. 'I used my jab and used my movement. I told him if it came to the sixth or seventh round then boom. 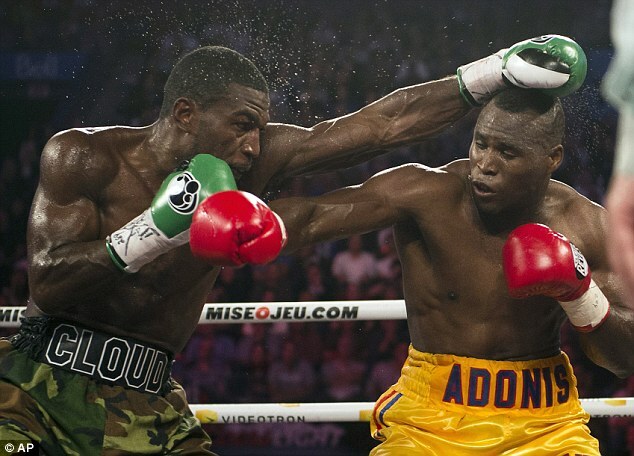 MONTREAL -- Adonis Stevenson retained the WBC light heavyweight title Saturday night at the Bell Centre when Tavoris Cloud failed to answer the bell for the eighth round after sustaining a cut over his right eye. 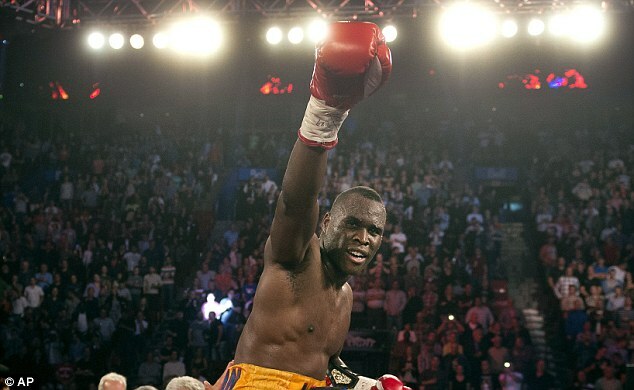 Stevenson (22-1) successfully defended the title he won in June with a first-round knockout of Chad Dawson. Cloud (24-2), the former IBF champion, also was cut on the left eyelid in the opening round. Stevenson, from Blainville, Quebec, is the only Canadian currently with a world title. He stung Cloud with a stiff left in the opening round that left the cut and swelling on his eyelid. Cloud rebounded in the second, but the right-hander rarely used his right hand. That drew taunting from Stevenson, who twice stood before his opponent with his arms stretched out, daring him to throw a punch. "I'm proud, because I worked hard and I showed I can box," Stevenson said. "I did everything according to my game plan. "My corner said to go to the body. I knew the longer it went on it would be in my favor because I was wearing him down." Stevenson's next fight is to be a mandatory defense against England's Tony Bellew, likely early next year. "I'm not 5-foot-10 like Cloud and I'm not scared or intimidated by Adonis Stevenson," said the 6-3 Bellew. "I'll come with a game plan and execute it." On the undercard, former champion Jean Pascal stopped George Blades with three knockdowns in the fifth round in a light heavyweight fight. Pascal (28-2-1) used the fight as a tuneup bout for his scheduled match in January with fellow Montreal fighter Lucian Bute. Blades is 23-5-2. "This does me an enormous amount of good," Pascal said after his first knockout since 2009. "I'm a guy with power, but it had been a long time since I knocked anyone out. Now, I'll go into camp with more confidence." In a matchup of Colombian light heavyweights, Eleider Alvarez unanimously outpointed Edison Miranda in a 10-round bout to improve to 13-0. Alvarez had winning scores of 99-90, 97-92 and 95-94.